The Freud Diablo D1050X 10 in. x 50-Tooth Combination Saw Blade is ideal for ripping and crosscutting wood & wood composites with the goal of a smooth finish. The best choice for a table saw when one blade is needed for ripping and crosscutting. Each set of 5 teeth is separated by a large gullet. The Freud Diablo D1050X 10 in. 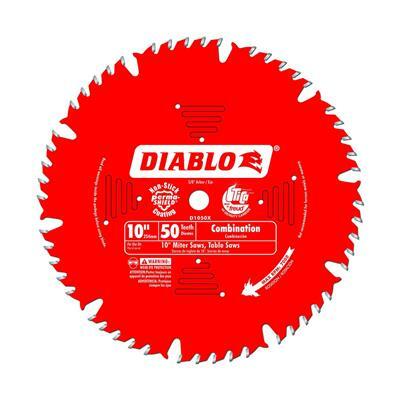 x 50-Tooth Combination Saw Blade is ideal for ripping and crosscutting wood & wood composites with the goal of a smooth finish. The best choice for a table saw when one blade is needed for ripping and crosscutting. Each set of 5 teeth is separated by a large gullet. Diablos large gullet provides the chip removal space required while ripping and the close grouping of teeth within the set provide the smaller bite size required when crosscutting. Hardened Steel Body warrants a longer life and sharper cutting edge.